So, last year I instituted the concept of birthday cookies which allows me to try different cookie recipes and if the result is delicious, I send the cookies off to family members on their birthdays. I’m mentioning this again because May is the most popular month for birthdays in my family, and I’ve been baking lots of cookies lately. There are two criteria for good birthday cookies. First, as I said, they have to be delicious, and the second requirement is that they be sturdy enough for packing and shipping. There’s an extremely simple cookie from one of my favorite books that I thought was going to be perfect. Then, I tasted it. It’s a pecan butter cookie from The Modern Baker, and after making many recipes from this book this was the first that I didn’t love. The flavor was a little flat, and I think the problem was that there was no salt in the dough. Those cookies ended up in the freezer, and I’ll eventually use them for a cookie crust. I’ll also eventually make the recipe again and add some salt. But since I was disappointed with them, I moved on to the Black Forest Chocolate Cookies shown here, and these are from the book Baked . At first, I was skeptical about the six eggs in the ingredient list and wasn’t sure the texture would be right, but an overnight chilling of the dough transformed it into a scoopable state. 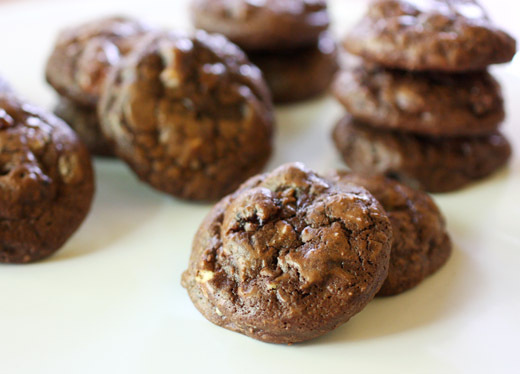 You end up with a crunchy, dark chocolate cookie filled with chocolate chips, white chocolate chips, and dried cherries. This one was worthy of being a birthday cookie. Chopped, dark chocolate was melted with butter in a double-boiler and then set aside to cool. Meanwhile the dry ingredients, flour, baking powder, and salt, were sifted. In a mixer, six eggs, and don’t be scared because six eggs really does work here, were combined with granulated sugar and brown sugar. The cool chocolate mixture was added with some vanilla extract and mixed. The dry ingredients were added and mixed to just combine. 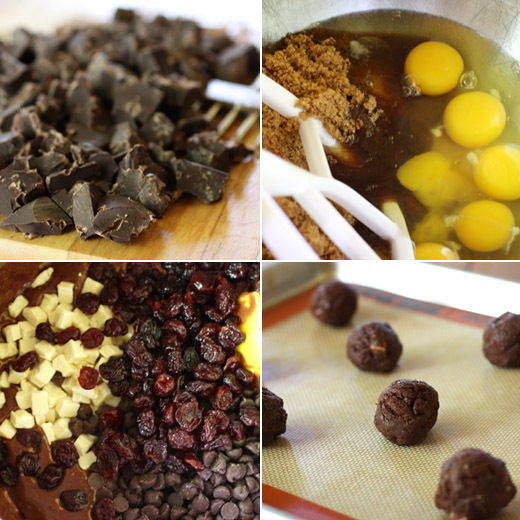 Last, the chocolate chips, white chocolate chips, and dried cherries were folded into the dough. The dough will seem much softer than cookie dough should, but it needs to be refrigerated for at least six hours or overnight. After being chilled, it’s just right. As the cookies bake, the tops become crackly, and then you have to wait for what seems like forever for them to cool enough so you can start tasting. 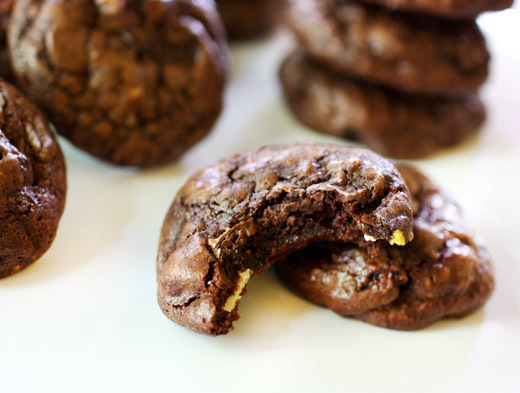 These are decadent, richly-chocolaty cookies with pops of sweetness from the white chocolate and dried cherries. And, they passed the sturdiness test for shipping. The coming months won’t be quite as busy for birthday cookie baking, but I’m always looking for good ideas before the next birthday arrives. It’s time for summer getaways or at least a summer state of mind, don’t you think? I was contacted by Travassa Destinations to help them celebrate their first anniversary, and it’s the perfect time of year to do so. They have properties in Austin, Texas and Hana, Hawaii, and the resorts focus on five core principles: culinary, wellness, adventure, fitness, and culture with chefs, yoga instructors, massage specialists, and adventure guides to bring them to life. To celebrate their anniversary, they have some special giveaways offered on their Facebook page, and I have a gift to offer here as well. I’ll pick one winner from the comments to receive a culinary package including a cocktail shaker, a vegetable garden kit, a pair of Native shoes, a Breville juicer, and wines from Club W. I received this same gift package, so I know it’s a great way to get summer started. 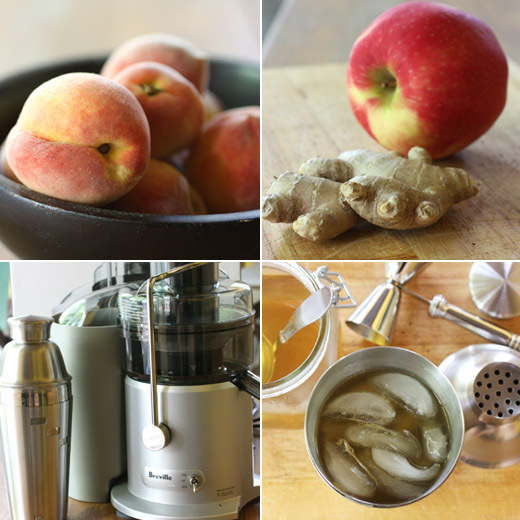 This was my first time using a juicer, and it’s delightful to turn fresh fruit into a beverage so quickly and easily. 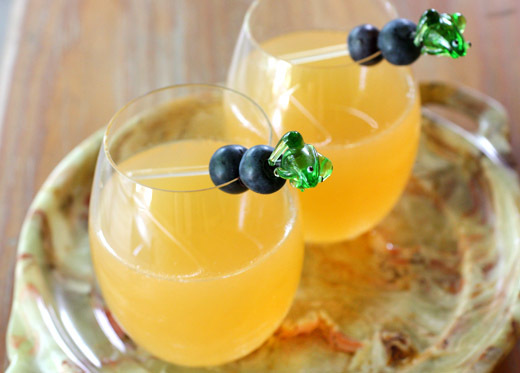 I had some local peaches to juice which I thought would be perfect with a little fresh ginger, and then I added an apple to round out the flavors. The juice blend was great on its own, but I took it one step further by mixing it with limoncello, rum, and ice in the cocktail shaker. 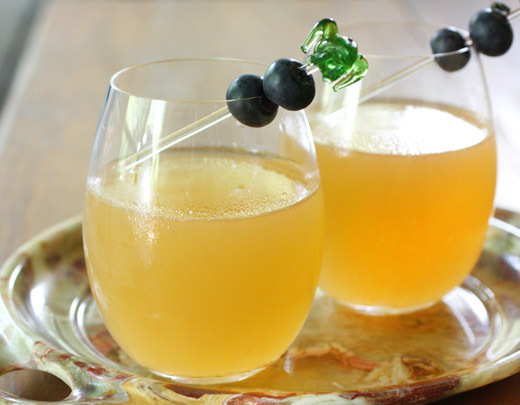 It was a cold, fruity, and zippy cocktail suited for a long, summer weekend. Leave a comment on this post for a chance to win the gift package. On Friday, June 1, 2012 at noon CST, I’ll pick one commenter to receive the gift. The winner will need to provide a mailing address in the US or Canada. Also, please leave an email address so I can contact you for your mailing information. Good luck and happy summer! UPDATE 1 JUNE 2012: The winner of the gift package is Ahu from Ahu Eats. It doesn’t even matter how late I am in getting to an issue of Donna Hay magazine. Every time, there is page after page of food I can’t wait to cook. The last issue I read was #60 which appeared at Christmastime in Australia, hence there are several cute Christmas cookies in it, but it was on our newsstands in March. There’s a strawberry lime and coconut pie, mini strawberry tarte tatins, and strawberry and lychee sorbet. I need to hurry to try those while strawberries are in season. Following those recipes is a story about curing fish with several beautiful and delicious-sounding salt mixes, and I’ll get back to those as soon as I can. Then, there was the roasted potato, asparagus, and herb salad which I made immediately. It reminded me a little of another Donna Hay salad with potatoes that I first made a few years ago, but this version was tossed with a mustard vinaigrette rather than a creamy dressing. You see how this goes? There’s seriously something I have to try on every page. When I arrived at the end of the issue, I learned a new Donna Hay book had been released. It’s called Simple Dinners , and unfortunately, it’s not available on Amazon right now. Hopefully, it will be soon. 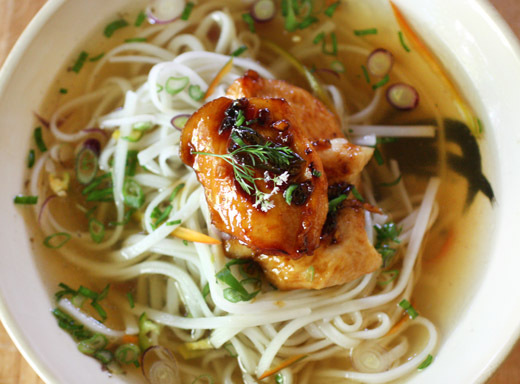 There were a few pages extracted from the book in this issue, and that’s where I saw this dish of Chile Chicken Noodles with Spicy Broth. It was incredibly simple to prepare as promised by the name of the book, and it involves a great trick to getting a nice glaze on the chicken pieces which I foolishly doubted at first. There are three parts to the recipe. Rice noodles were cooked and set aside. Then, a spicy broth was made was simmering ginger, chiles, and some Shaoxing wine in chicken or vegetable stock. The third part is the chicken itself. Pieces of sliced chicken breast were tossed with chile jam, and I used a locally-made jalapeno jelly. After coating the chicken well, the pieces were cooked in a little oil in a frying pan. The noodles were divided between bowls and covered with the spicy broth. 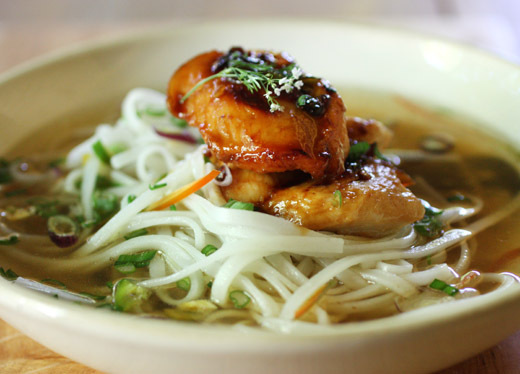 The sticky, sweet, and spicy chicken was placed on top, and the bowls were garnished with green onion, or garlic chives from my garden and purple spring onions in my case, and cilantro. I wasn’t sure it would be a good idea to put the chile jelly or jam on the chicken as it cooked since I thought it might burn. I wondered if it would be better to coat the chicken after it had cooked. I tried a couple of pieces of chicken that way, and I was wrong. Coating the chicken after it cooked failed to give it a good glaze. Since the sliced chicken pieces were small enough to cook quickly, the jelly had just enough time to slightly brown and form a sticky glaze as it should. Now I have another quick meal with big flavor to turn to when I need it. And, I have several more recipes from that magazine to try. It had been months, actually almost two years, since I saw Dan Lepard’s Peanut Chile Bread, and it was high time I tried making it. But, every time I set out to make a bread with commercial yeast, my sourdough starter feels neglected, overlooked, like I’m cheating on it. I couldn’t have that. It had been too long since my starter and I had spent time together, so I took Dan’s recipe and combined it with the sourdough bread recipe that I use more than any other. That is the Norwich Sourdough that came from Susan at Wild Yeast. 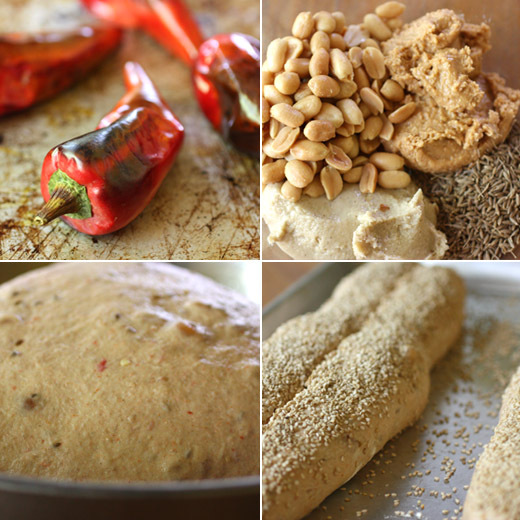 From Dan’s recipe, there are roasted, spicy, red chiles, cumin seeds, peanuts, chunky peanut butter, and tahini. I mixed all of those ingredients into the Norwich sourdough right after the autolyse, and it worked like a charm. I got to try this bread without breaking my starter’s heart. 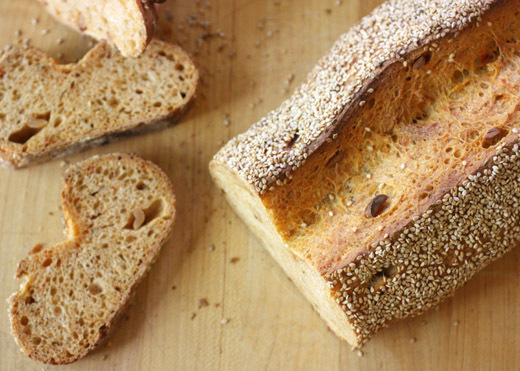 The result was sesame-crusted loaves with a rosy-hued crumb from the chiles. It was nutty and a little spicy and perfect with some olive oil for dipping. I used fresno chiles, but whichever red chile you prefer is fine. They were roasted under the broiler and left to cool. Stems and seeds were removed, and the chiles were chopped. Tahini, peanut butter, cumin seeds, and salt were placed in a bowl, and hot water was poured over them. The chopped chiles were added along with some cold water and the peanuts. Since I was turning this into a sourdough, I used one-third of the total water for the recipe at this stage. The other two-thirds was used to begin the dough by combining it with starter, bread flour, and rye flour. That was mixed in a stand mixer with a dough hook for a few minutes and then left to sit for 20 minutes. After 20 minutes, the chile and peanut butter mixture was added to the dough, and it was mixed until well incorporated. The dough was then left to rise in a wide bowl in which it could be turned without removing it to a work surface. The dough was turned at 50 minutes and then at 100 minutes while fermenting for a total of two and a half hours. After fermentation, the dough was turned onto a work surface and divided. It was allowed to rest before being shaped into long loaves. The loaves could have proofed at room temperature until ready to bake, but I proofed them partially at room temperature and then overnight in the refrigerator. The next morning, as the oven pre-heated, the loaves were brushed with water, sprinkled with sesame seeds, and slashed down the middle. They baked until golden and crisp-crusted. 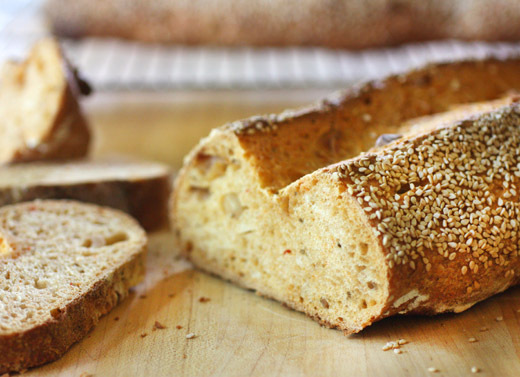 This flavorful bread was great alongside a salad and with soup, but my favorite use of it was for spicy carrot sandwiches. Those sandwiches were mentioned in the March issue of Food and Wine. 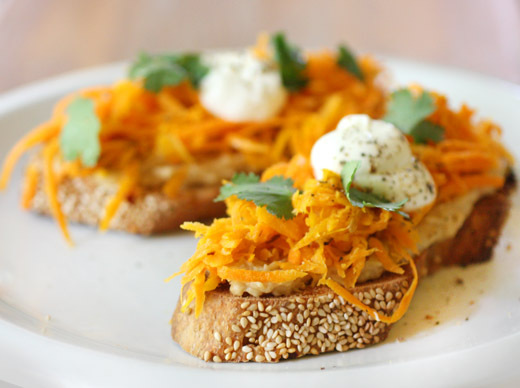 After toasting the bread, hummus was spread on it and then topped with grated carrots that had been briefly cooked with sliced garlic, crushed red pepper, and I used cumin seeds instead of caraway. A spoonful of Greek yogurt finished the sandwich. The nutty bread and spicy carrots made a great match. The 2012 James Beard Foundation award winners were just announced. In Austin, we're all extremely proud of Paul Qui who won Best Chef Southwest. This year's Outstanding Chef was Daniel Humm. The James Beard Foundation has been giving annual awards since 1990, and the foundation celebrated its 25th anniversary in 2011. I received a review copy of the book The James Beard Foundation's Best of the Best which honors all the recipients of the Outstanding Chef title from the first that was awarded through the 2010 award. While this isn't a cookbook for quick and easy weeknight dinners, it is a wonderful collection of bios of all the Outstanding Chefs, and each bio is accompanied by a signature dish or two or three from the chef. I probably won't attempt the Hot Potato, Cold Potato, Black Truffle, Parmesan dish from Grant Achatz who won in 2008, but it is fascinating to read about how it's made after reading about Achatz's career. There are photos of most of the dishes, and the salads are all gorgeous and very approachable. There's a Beet Salad with Mango, Feta, Orange, and Mint from Alfred Portale, a Greenhouse Salad with Blue Hill Farm Yogurt from Dan Barber, and a Summer Salad from Alice Waters. I'd love to adapt and simplify a couple of the recipes like the Chilled Honeydew Melon Soup with Crab Remoulade from Jeremiah Tower and the Spice-Roasted Lobster with Buttermilk Chutney from Tom Colicchio. What was most interesting about this book was learning how several of these chefs have worked together or under some of the same chefs at some point in their careers. And, did I mention the photos of the food? 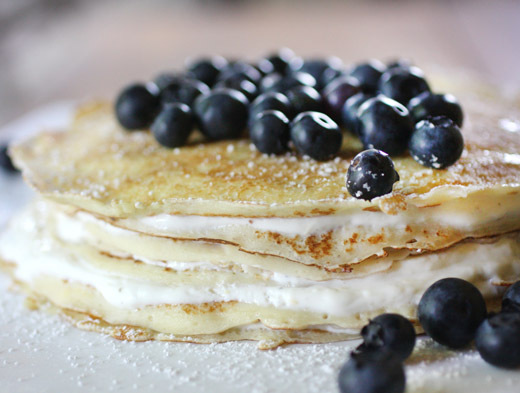 There is page after page of very beautiful food. 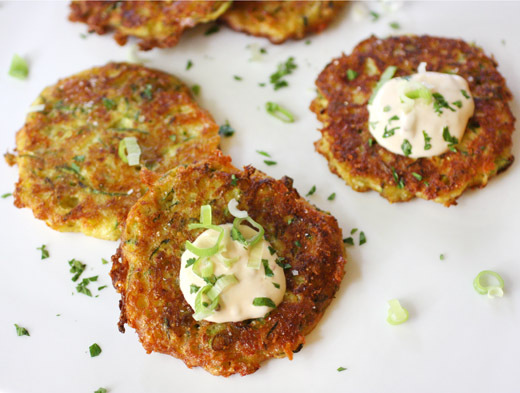 While most of the recipes are somewhat complicated chef dishes shown just as they are served at the restaurants, a few of them are very doable. One of those is the Green Herb Ceviche by Rick Bayless who was Outstanding Chef in 1995. Here in Austin, we're surrounded by many, great Mexican restaurants, and I order ceviche from their menus often. 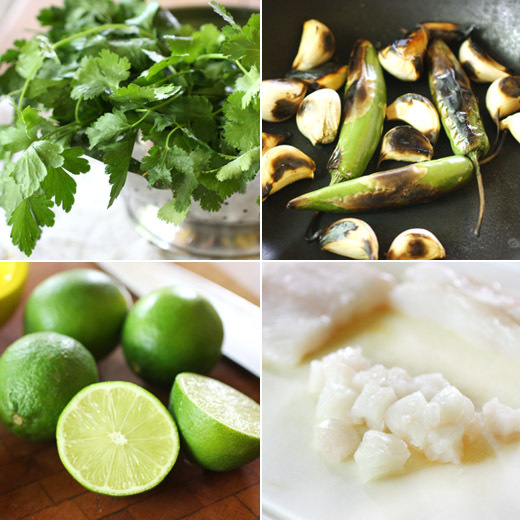 The few times I've made it at home, I went the simple, classic route with lime juice and chiles. 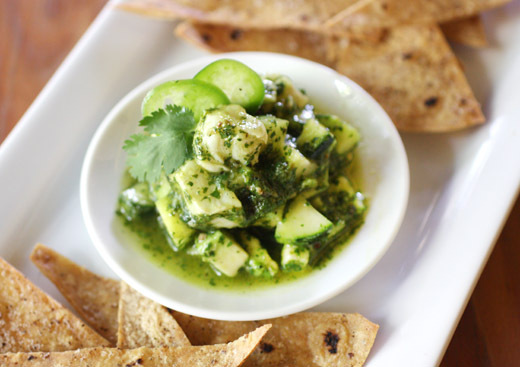 This ceviche caught my eye because it started with an herb seasoning made with garlic, serranos, cilantro, parsley, and olive oil. The chiles and garlic were roasted before being pureed with the other ingredients. Some of that puree was mixed with lime juice for the marinade for the fish. I used halibut which was cut into small chunks before being left in the lime juice mixture for about an hour. Small chunks of cucumber were marinated with the fish as well. Just before serving, chunks of avocado were added to the ceviche. 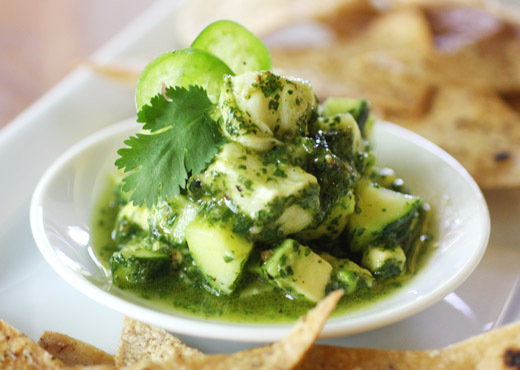 I loved the herby green of this ceviche, the fresh crunch of cucumber in it, and of course the avocado. I have to say, it's fun to attempt to cook like an Outstanding Chef. It's also fun to flip through a yearbook of sorts of some of our very best American chefs. 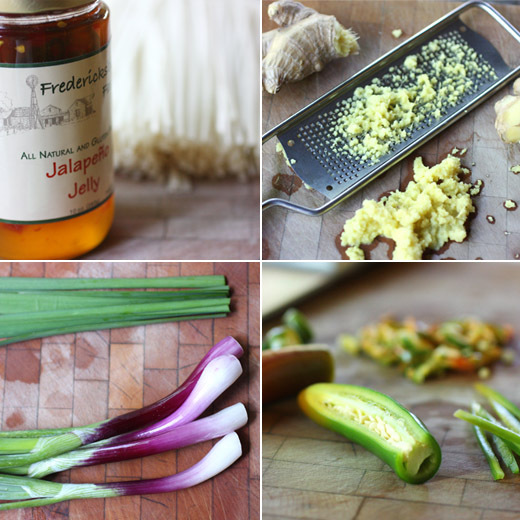 Recipe re-printed with publisher's permission from The James Beard Foundation's Best of the Best . 1. Set a dry skillet over medium heat. Lay in the unpeeled garlic cloves and chiles. Roast, turning frequently, until they are soft and blotchy brown in spots, about 10 minutes for the chiles and 15 minutes for the garlic. Cool until easy to handle, and then slip the skins off the garlic, pull the stems off the chiles, and roughly chop (no need to remove the seeds). 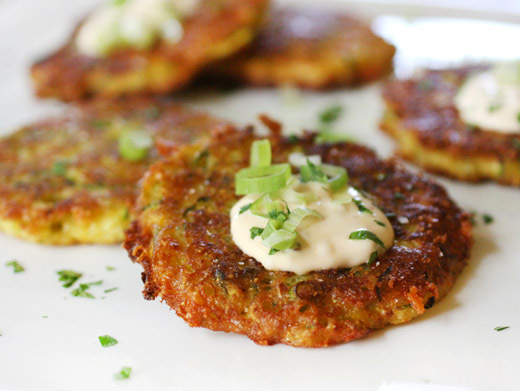 Put them in a food processor along with the cilantro, parsley, oil, and two generous teaspoons salt. Process until nearly smooth (it will be pasty). Scrape the mixture into a storage container and refrigerate until serving time. 1. 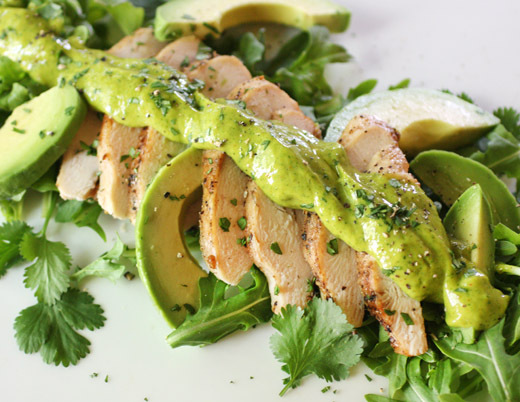 In a large bowl, whisk together the lime juice and 1/2 cup of the herb seasoning. (Cover and refrigerate the remainder for another preparation.) 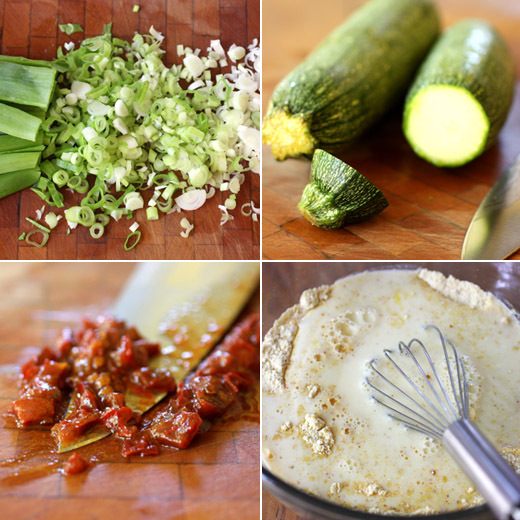 Add the fish and cucumber, and stir to combine. 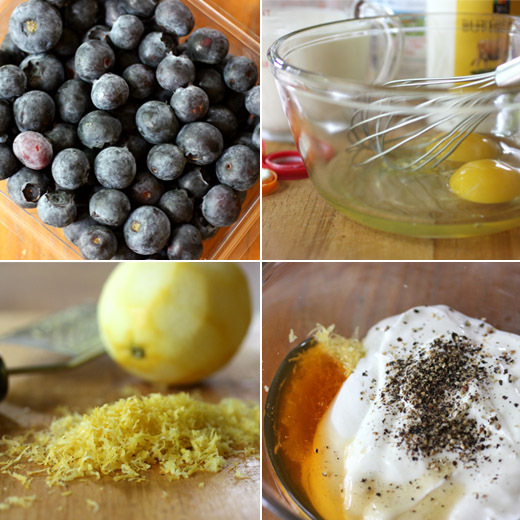 To blend the flavors, cover and refrigerate for 1/2 hour (for best results, no more than one hour). 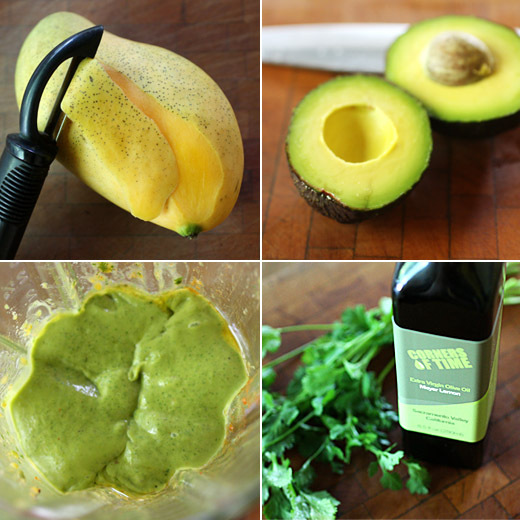 Taste and season with a little more lime juice or salt if needed, then gently stir in the avocado (save a little for garnish if you want). 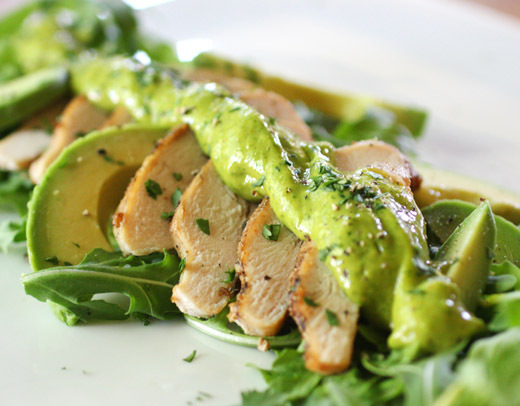 Serve on plates or in martini glasses lined with lettuce leaves. I am a caramel person and a butterscotch person. They’re different but similar, but caramel is a little more photogenic. I accept that I’m not capable of making a butterscotch filling in its unfortunate color look good in a photo, but I won’t accept anything butterscotch that doesn’t taste great. I have a history with butterscotch puddings and pies. I've tried a few puddings that tasted as bad as they looked. And years ago, I attempted a butterscotch pie that left me completely disappointed. The filling was thin and runny, and once cut, the pie was useless. When I complained about this to my Mom, she mentioned that butterscotch pie was my Grandmother’s favorite. I had no idea. Grandma also loved meringue, and I didn’t previously know that either. 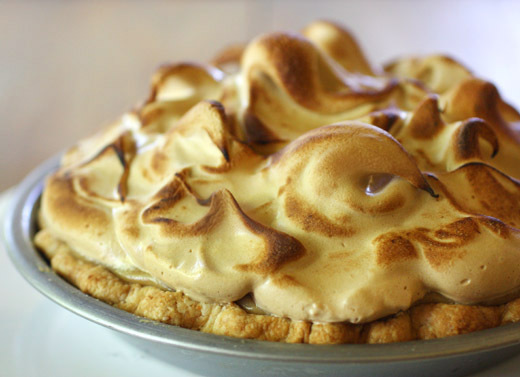 Since Mom didn’t have Grandma’s recipe for a meringue-topped butterscotch pie, I became determined to find a good one. At last, that day has arrived. This pie is from Gesine Bullock-Prado’s new book Pie It Forward , and I received a review copy. This book is as fun to read as her last one , and the lighthearted nature of it makes you want to get baking and enjoy the results. It starts with a few different dough recipes and some great tips for working with dough and baking a perfect crust and then moves through sweet and savory pies and tarts. Going through the book, I kept longing for the start of different fruit seasons. There are gorgeous Blueberry Brown-Butter Tartlets, a Schwarzwald Tart that’s like a black forest cake in pie form, a German Apple Custard Tart, and a Buttermilk Peach Pie. One section is devoted to chocolate with a Fleur de Sel Caramel Almond Brownie Pie and Chocolate Orange Souffle Tartlets among others. At the end of the book, there are recipes for more challenging desserts involving multiple layers, fillings, jaconde sponges, and chocolate transfer sheets. They’re beautiful creations, and someday I’d love to try making the tall, striped Bee Sting with flavors of almond, chocolate, and honey. 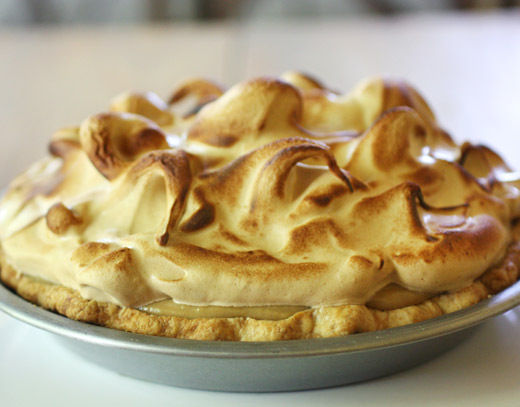 When I spotted the Butterscotch Meringue Pie in the book, I knew I had to try that first. I have to tell you about the four parts of this pie because they were all fantastic. First, the crust was one of the flakiest I’ve ever made, and interestingly, it included some sweetened condensed milk which gave the dough great flavor. Then, after the crust was blind-baked, it was covered with a layer of caramel. I actually made the caramel twice because the first time I didn’t think it was dark enough. Gesine was kind enough to answer my question about the caramel being light in color on Twitter, and she suggested cooking it longer or to a higher temperature than noted in the recipe. The second time, I melted the sugar first and cooked it until amber in color, then added the butter and cream, and cooked the mixture while stirring until it reached 240 degrees F. That time, it was a good caramel color. After spreading the caramel in the pie crust, I couldn’t control the urge to sprinkle it with sea salt. Next came the butterscotch filling. It was a delicious custard of brown sugary butterscotch, and there’s really nothing you can do about its color. Butterscotch is always an unappealing, dull brown. That doesn’t matter here though considering that the filling was entirely covered by the meringue, and stop everything now if you have never made a brown sugar meringue. You must. It’s a pearly brownish color rather than a bright white, and the flavor is like fluffy, mild butterscotch. I swirled the meringue on top and torched it to a toasted brown. This was a decadent pie, and it was heaven for a butterscotch and caramel fan. I’m pretty sure it’s not exactly how my Grandma made her butterscotch pie, but I’m glad I’ve found such a great version to make for myself. And, now that berries and peaches are coming into season, I have more pies to bake. Recipe re-printed with publisher’s permission from Pie It Forward . 1. Preheat the oven to 350 degrees F (175 C). Roll the dough into a rough 11-inch (28 cm) round. Line a 9-inch (23 cm) pie plate with it and crimp the sides decoratively. Dock the bottom and freeze it for 20 minutes. 2. Line the crust with parchment, fill it with pie weights or dried beans, and bake it for 15 minutes. Remove the parchment and pie weights. Bake the crust for 20 minutes more, or until it is golden brown and baked through. Set it aside to cool completely. 1. Combine the granulated sugar, cream, butter, and salt in a heavy-bottomed saucepan over low heat and cook, stirring, until the sugar has melted. Clip on a candy thermometer and heat until the caramel reaches 240 degrees F (116 C), then allow it to cool completely. 1. Whisk together the brown sugar, vanilla, cornstarch, egg yolks, salt, and ½ cup (120 ml) of the milk in a mixing bowl. 2. Heat the remaining milk and the cream in a saucepan over medium heat until it comes to a simmer. Slowly pour the milk-cream mixture into the sugar mixture, whisking constantly until smooth. 3. Return the mixture to the saucepan and cook it over medium heat, whisking, until it thickens to the consistency of mayonnaise. Transfer the custard to a bowl, and cover the top with a piece of plastic wrap laid directly on the surface to prevent a skin from forming. Set aside to cool to room temperature. 1. 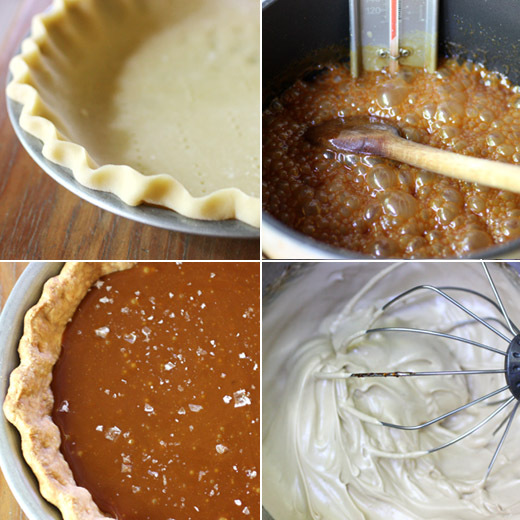 Pour the caramel into the cooled crust and smooth it along the bottom and sides, using a small offset spatula. Spoon the custard over the caramel and refrigerate the pie until the filling is cool and set. 2. Begin making a meringue by combining the brown sugar and ½ cup (75 ml) water in a heavy saucepan over low heat, stirring until the sugar has melted. Attach a candy thermometer and heat the sugar mixture until it reaches 234 degrees F (112 C). 3. While the sugar syrup is cooking, place the egg whites and salt in the bowl of an electric mixer fitted with the whisk attachment. Whisk until the egg whites are foamy. 4. Once the sugar syrup has reached temperature, turn the mixer to medium-low and pour the sugar along the inside of the bowl (not directly into the egg whites, to keep from scrambling the eggs). Increase the mixer speed to high and whisk until you achieve stiff peaks. 5. Top the custard layer with the meringue, creating swirls and peaks with the back of a spoon. Gently brown the meringue with a kitchen torch. Do not use a broiler to brown the meringue, as this will melt the custard. Makes 2 ½ pounds (1.2 kg) dough, enough for 3 to 4 (8- to 9-inch/20- to 23-cm) tarts or 12 to 16 mini tarts. 1. In the bowl of a food processor fitted with the blade attachment, pulse together the flour, butter, and salt until the mixture resembles cornmeal. 2. 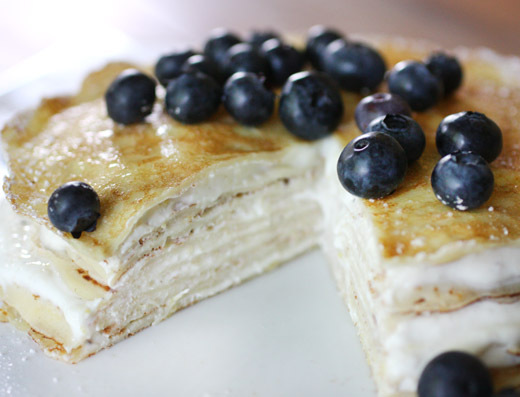 In a small bowl, whisk together the condensed milk and egg. While pulsing, slowly pour this into the flour until the dough just comes together. 3. Turn the dough out onto a lightly floured work surface and gently turn over a few times until it is smooth, the dry ingredients have been completely integrated, and the dough holds together. Take care not to overwork it. 4. Shape the dough into a loose circle, cover it with plastic wrap, and allow to rest in the refrigerator for at least 20 minutes. Some kitchen tasks are more enjoyable than others. Nothing beats rolling fresh pasta dough, and I can't explain it, but pitting cherries is fun for me. Then, there are the kitchen things that I don't look forward to doing at all. Washing dishes takes first place in that category, and not far behind that is peeling shrimp. I've gotten a little faster at peeling and deveining in recent years, so it's not quite as dreaded now as it used to be. And, then, there are artichokes. Facing the task of prepping fresh artichokes feels like heading into battle. Those leaves are tough, and they have pointy spots and seem to fight back. You have to use some force to cut through those leaves and then to peel around the heart. When you finally get to removing the choke, you end up with fine, hair-like pieces all over your work surface. All the while, the artichoke is quickly turning brown even though you keep rubbing it with lemon before dropping it into a bowl of water with more lemon. I can't help but feel a bit defeated when after the battle, what remains of the artichoke to be eaten is tiny compared to the size it was when this all started. So, I've developed a coping mechanism for the stress of prepping artichokes. I remind myself how short their season is. I tell myself that locally grown artichokes weren't even available a few years ago, and we're lucky to have them now. I think of the cleaning process as a rare spring event that's necessary to endure in order to enjoy the flavor of fresh artichokes. Last, I find a great recipe that's going to make all that effort very worthwhile. This panzanella was just such a recipe, and it's a vision of spring on the plate. It's is also from Girl in the Kitchen , and I was reminded of it when I pulled the book off the shelf for the Pistachio-Cilantro Butter. 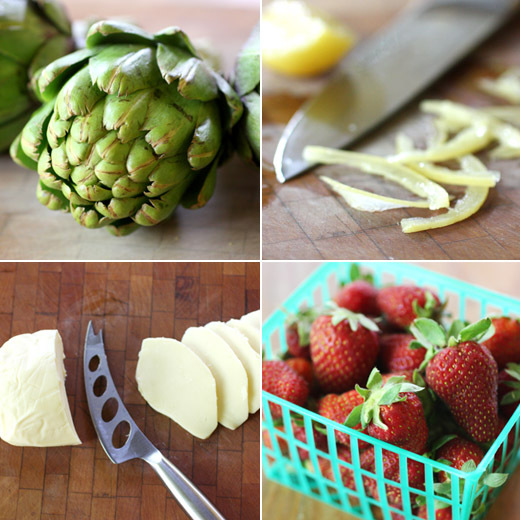 After convincing myself to approach the artichokes with a positive attitude and prevailing in the battle of their prep, the cleaned hearts were cut into eight pieces. They were cooked in a mixture of olive oil, stock, white wine, lemon juice, garlic, and salt. It was interesting that this cooking liquid became the dressing for the salad. After the artichokes became tender, after about 25 minutes, they were removed from the pan. Then, the cooking liquid was boiled and reduced to about one half cup. Meanwhile, bread cubes were toasted, and the strawberries that arrived in my CSA were washed and sliced. Basil should have been used in this salad, but I didn't have any basil growing yet that day so I used parsley instead. One last ingredient was preserved lemon, and the rind was julienned. 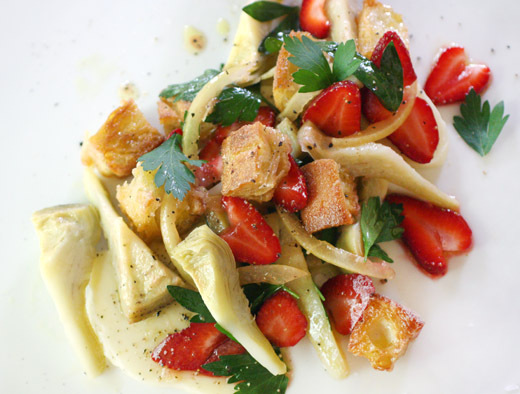 The artichokes, bread cubes, strawberries, parsley, and preserved lemon were tossed with the cooled, reduced cooking liquid. That mixture was served over slices of fresh mozzarella. The dressing was surprisingly flavorful, and the preserved lemon gave the salad a nice, bright punch. Sweet strawberries and fresh mozzarella were a great match with the crunchy toasted bread. And, what about those artichokes? 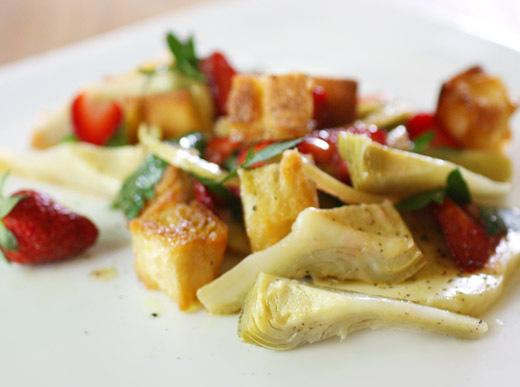 This is the kind of dish that will make the artichoke battle easier to face each time.